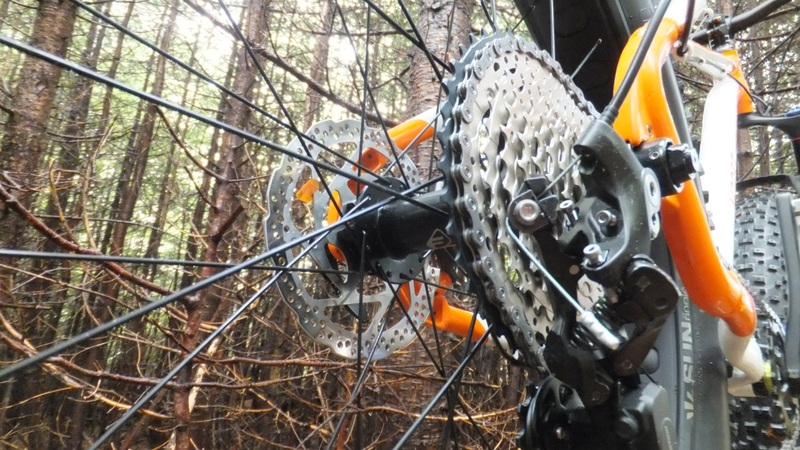 Buying a fat bike can sometimes feel like a bit of a chore when you have several local bike shops carrying several brands of fat - oh the selection. However, when the nearest bike shop is several hours away, securing a fat steed can be a little more trying. Moose Bicycle is primarily a direct to consumer bike company based in Canada - Montreal, Quebec to be specific. 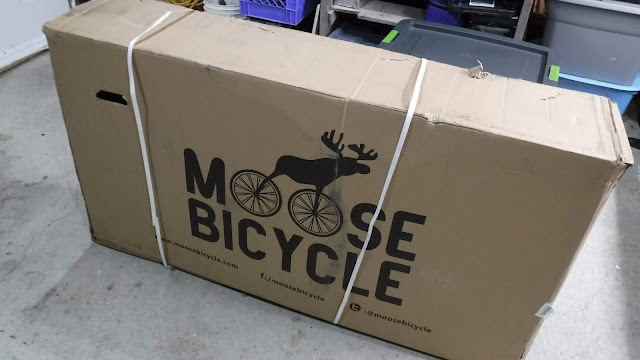 While there are a few select bicycle shops that carry their brand, you can order a Moose fat bike, plus accessories, directly from their web site and have it delivered to your door - as long as you are in Canada or the lower 48 states. 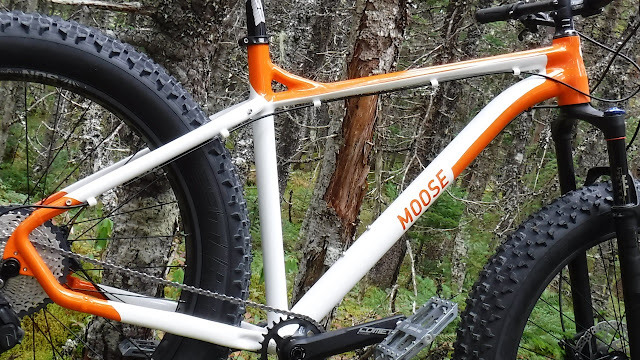 The folks at Moose Bicycle were kind enough to supply Fatbike Republic with a Moose 3 fat bike for some serious dirt and snow testing. 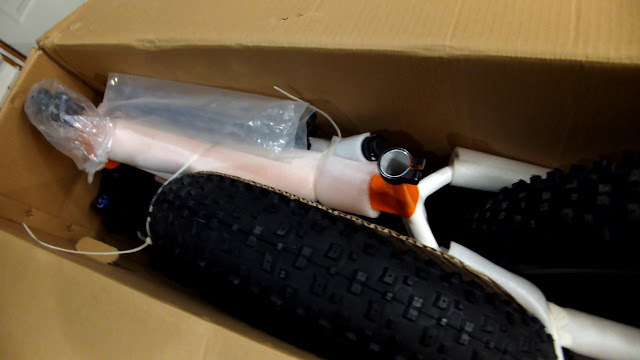 The Moose 3 traveled across the country, in a standard fat bike shipping box, arriving safe and sound. Cutting the straps and removing the staples revealed the Moose 3 all snug and secure. Be sure to check out the unboxing video below for more info. You don’t need many bike specific tools to assemble this fattie. Basic assembly can be accomplished with a regular set of metric allen keys – something you may have in your tool box already or can easily get at any hardware store. I normally assemble my bikes in a bike stand, but I didn't this time as not everybody has one. Even without the stand the assembly took very little time. The frame of this orange and white beauty is manufactured from 6061 T6 aluminum which is commonly used in the bike industry because of it’s strength and durability. The tapered top tube joins almost seamlessly to the 30.9 seat post, while the sturdy down tube completes the relatively large triangle. 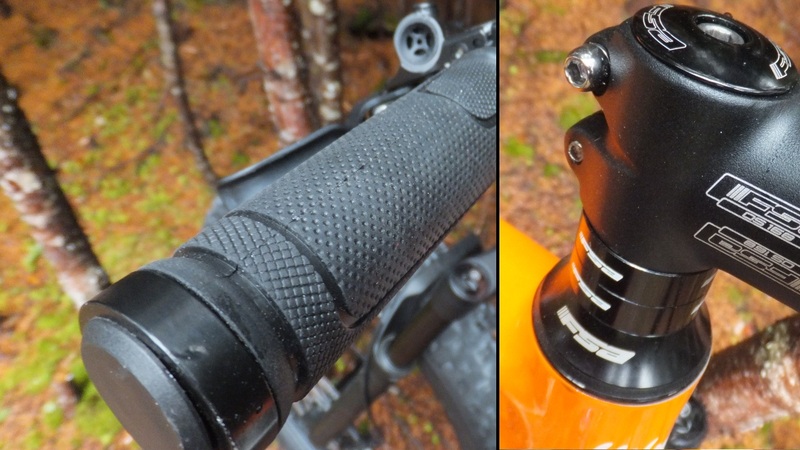 The head is tapered and suspension corrected, with a head tube angle of 69 degrees. 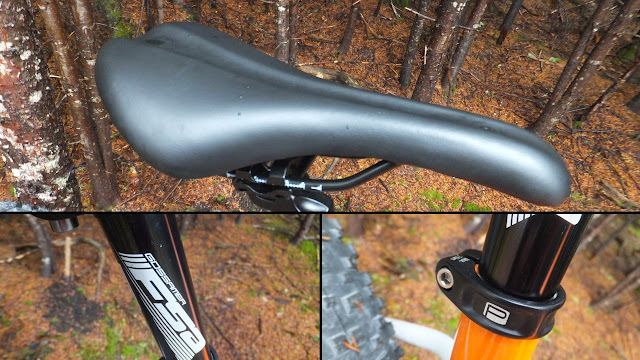 The rear end sports a spacious 197 mm opening with a chainstay length of 448.6 mm. 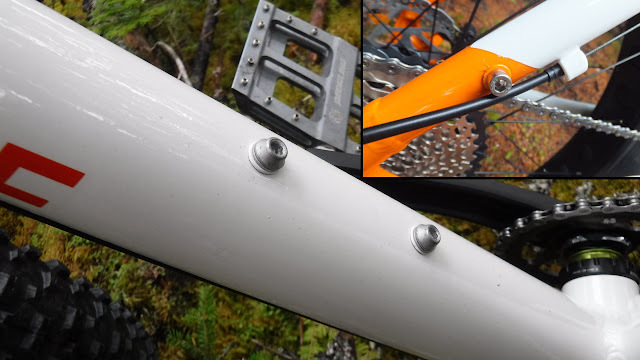 While there are no internal cable routing ports, the Moose 3 does have the requisite water bottle mounting bolts and rear braze-ons for mounting a rear rack. If you are looking for a boring monochromatic paint scheme, look somewhere else. 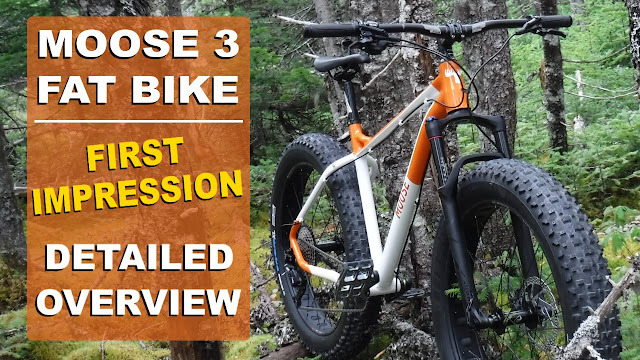 The Moose 3’s bright white and orange paint really catches your eye. 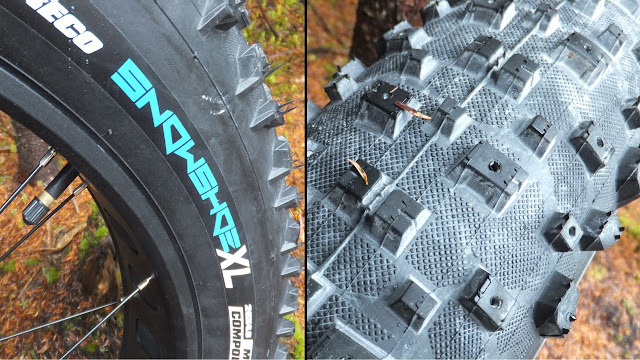 The automotive baked paint should definitely hold up to years of use on the trails. While the other fat bikes in the Moose Bicycle inventory have a solid front end, the Moose 3 has a little spring in its step as it sports a 120 mm Rock Shox Bluto RL. The Moose 3 runs a 1 x 11 drivetrain comprised of FSA and Shimano components. 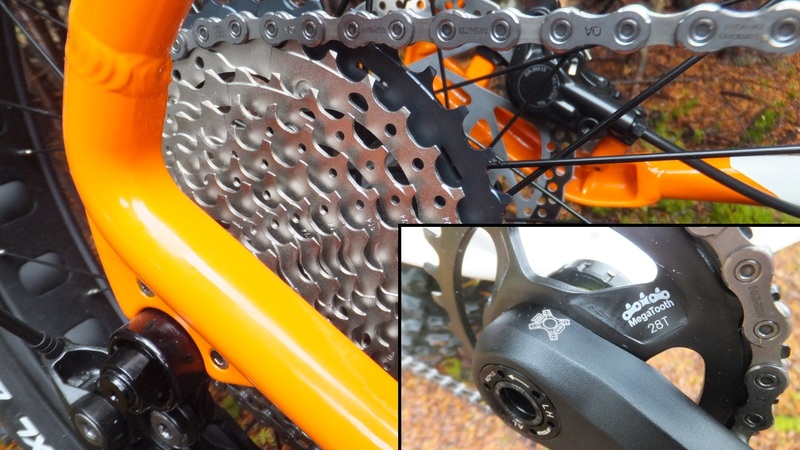 A FSA Comet direct mount crank with a 28T chainring connects to a Shimano SLX M7000 11 speed cassette (11-42) via a Shimano 11 speed chain. 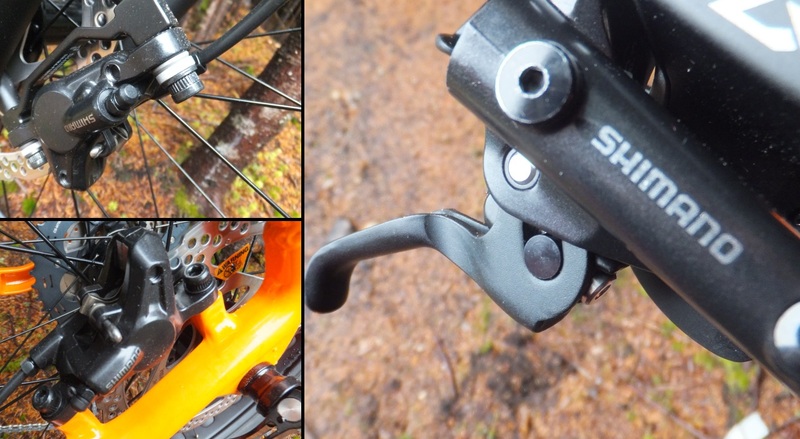 Shifting through the gears is a mid-range Shimano Deore XT M8000 derailleur mated to a Shimano SLX M7000 shifter on the bars. 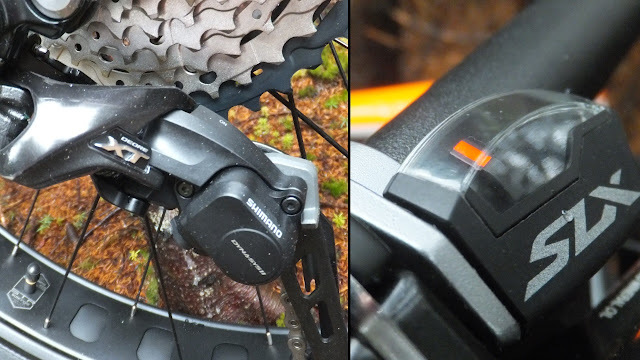 The M8000 is touted to be tough and reliable and made for big wheels, while the M7000 push-pull upshifting capability gives riders options when wearing heavy gloves. 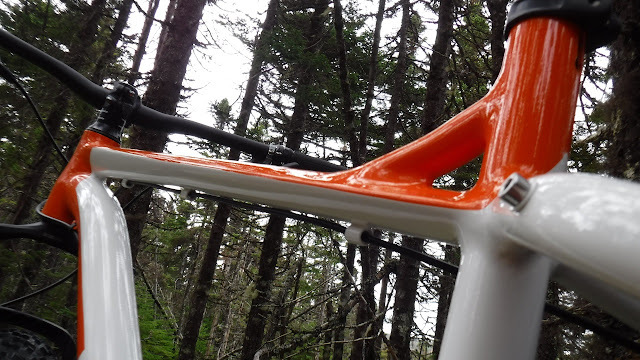 Stopping the orange and white beast is accomplished by a pair of hydraulic Shimano Deore M615 “two-finger” levers on the bars and matching calipers on either end. The M615 runs mineral oil through its veins, benefits from trickle down technology, and has simple to use reach adjustments for a perfect fit. Rounding out the braking package is a standard 160 mm rotor in the rear and larger 180 mm rotor in the front. Moving the Moose 3 through the dirt and snow are a pair of 26 x 4.8 Vee Snowshoe XL fat tires. These rubber meats are manufactured with the multi-purpose compound (MPC) having a durable 72 TPI. While the tires are studdable, they come unstudded on the bike. Claimed weight for these tires is 1530g a piece. 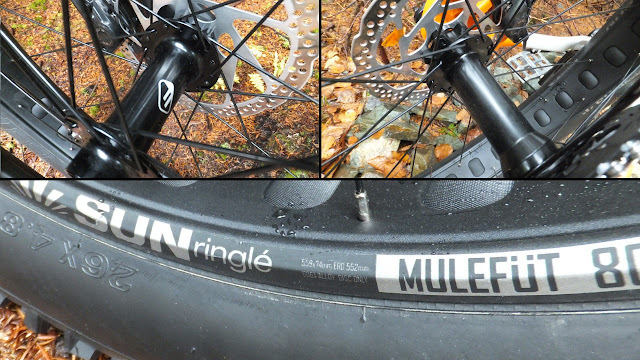 A Formula 12 x 197 hub in the rear and matching Formula 15 x 150 hub in the front keep the Mulefut 80SL rims rolling. 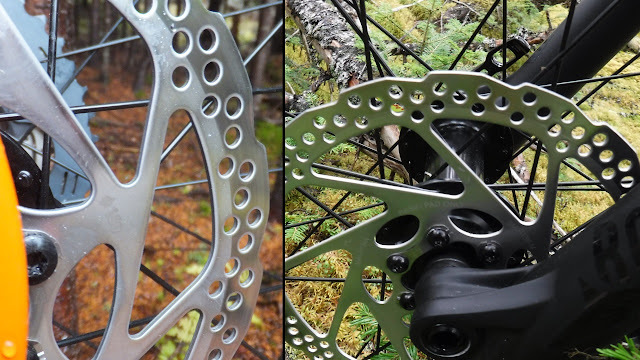 Both hubs have sealed bearings to keep the elements out and convenient quick release axles. 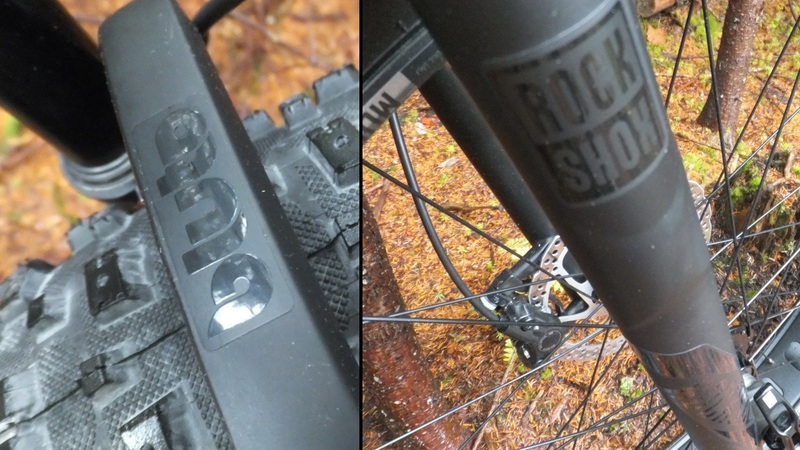 What's interesting to note is that the Moose 3 sports tubes with the "larger” more robust schrader valves as opposed to the “skinny” presta valves. The Moose 3 gets some additional FSA gear in the cockpit area. 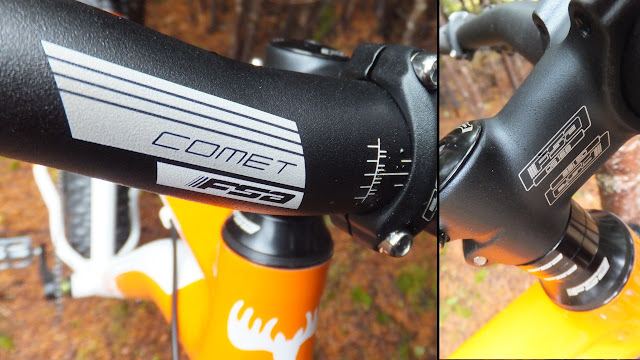 Connecting the 740 mm x 31.8 FSA Comet bars to the bike is a relatively short 60 mm (6 degree rise) FSA stem. Dimply Moose lock-on MTB grips grace the bar ends, while a FSA headset, spacers, and top cap round out the front section of the Moose 3. A 30.9 alloy FSA Comet seat post supports a curvy yet comfortable looking Vader MTB saddle, while an alloy seat post collar keeps everything snug under the seat. 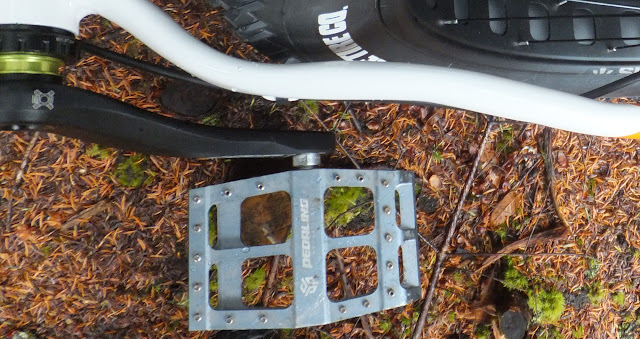 You will have to supply your own pedals as they are absent from the Moose 3 stock setup - this is not uncommon with many mid to high range bike purchases. 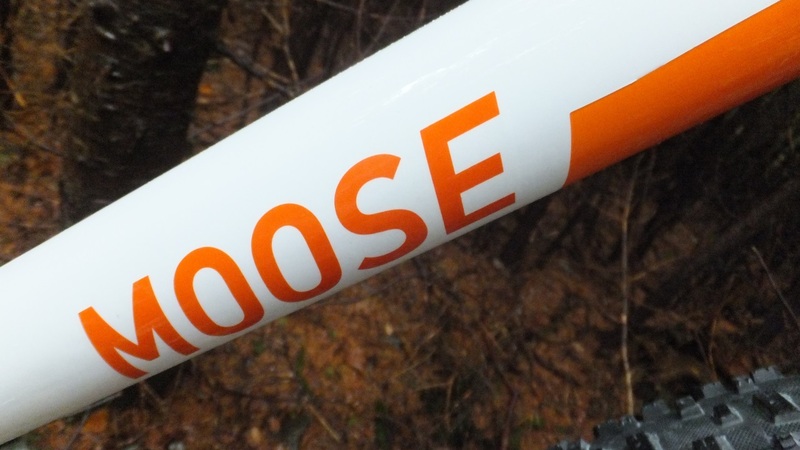 The Moose 3 was easy to assemble with very few tools needed for the initial setup. A shock pump is required to tune in the Bluto and you will need a low pressure tire gauge to ensure that you are running optimal pressure for trail conditions. For pedals I popped on a set of Catalyst pedals from Pedaling Innovations - I like their large footprint. For additional details on these pedals check out the review. I’m not a big fan of standard seat post collars. 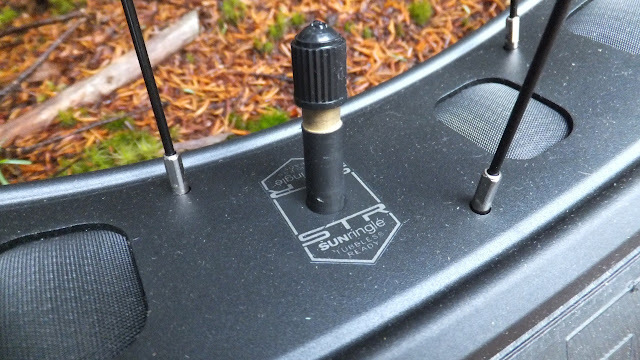 I don't want to use an allen key to adjust the seat post height while on the trail. Before I actually hit the trails I swapped in a quick release collar so adjustments are much easier. I was pleasantly surprised with the initial fit and finish. Not knowing what to expect from a new to the scene direct-to-consumer bike company I was pleased with the paint and the welds looked tidy. 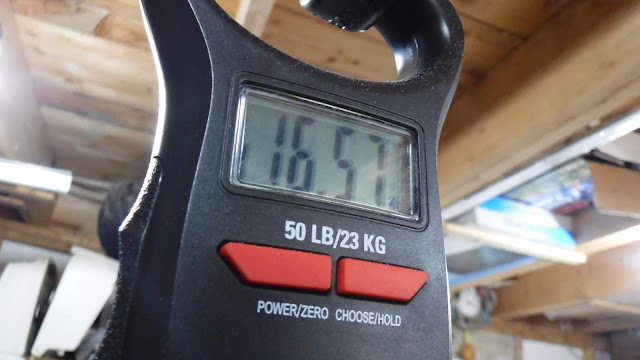 Weighing in at 16.57 kg (36.5 lbs) this fat bike is not what I would call heavy - especially since it is sporting a front shock. During the Moose 3 break-in test spin I was a pleased that there were no gearing or brake adjustments required - everything operated as expected. With the bike ready to roll, it's time to do some serious riding and see how this orange beast from Moose Bicycle reacts to the dirt and the cold white stuff.